being little • bristol uk fashion & lifestyle blog. : puurrrrrfect day. I want this shirt. SO bad. Anything cat-patterned is amazing. Such a pretty skirt, it looks so nice against the green. Gorgeous cat, aww! I really love your cat shirt too, very cool! Nice shirt. Prehaps it looks better fully buttoned up. Isn't it? I've been eyeing up that shirt in Zara for a while now, looks lovely on you! I need a sheer shirt! The one you've snagged is freaking lovely! I love what you've got underneath it, as well. A little bit of lace detail - so cute! Your kitty is adorable as well. This entire post just made me smile! Sorry to sound like a creep hah! That shirt is so sweet! Lovely lovely shirt - so glad the weather's brightening up and pretty much inviting floaty materials! What a cute printed top! I love the appearance of the (real) cats in your photos...it's too cute! i still love that print and always will. that cat reminds me of my baby girl, cuuute! I want to be a mad old cat lady. P.S I love the shirt. 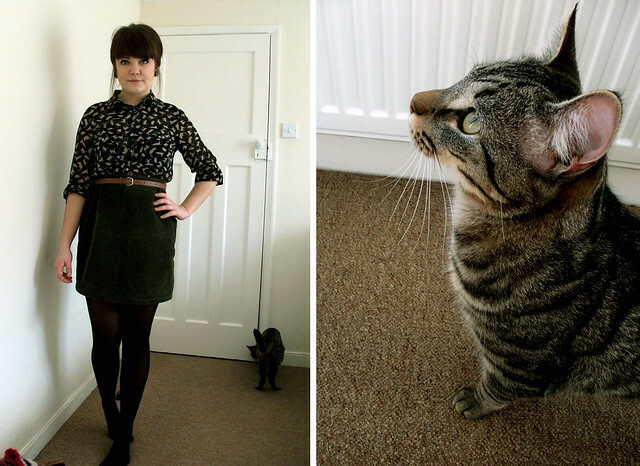 I love that blouse, but not as much as I love that absolutely adorable cat! just wanted to say that your blog has become my new fave. cat print?! :) i love this. chocolate and raspberry puddingy cakes. people aint what they seems. all i have to say.